Since 1952, TOPS has provided quality products and services to businesses throughout the world. TOPS continues that commitment providing innovative, high quality value-added products for the office, school and home. TOPS time cards record weekly time in and out, show full pay calculations, and feature an employee signature line. Made from 143 lb. 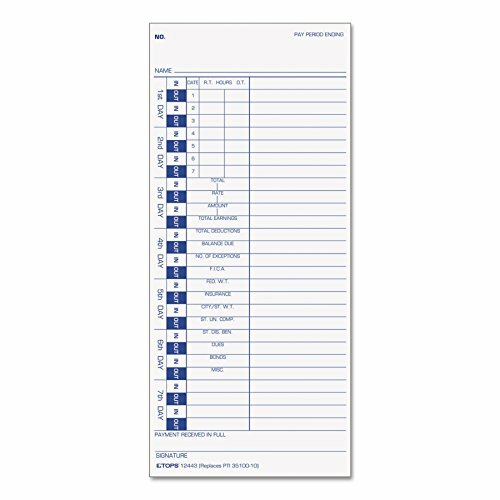 white tag stock, the TOPS time cards are one-sided and printed on the front with blue ink. They are great for use with Pyramid time clocks Model 35100-10. Each card measures 4 x 9 inches, and there are 100 time cards per pack. Whether it's notebooks, writing pads, record books, time cards, or any of the hundreds of items we offer, you can count on TOPS products to help.